Is there anything that sounds better than sipping on a glass of wine while soaking up a Northern California sunset? We didn’t think so. The next time you’re looking for a place to experience the most picture perfect date night, look no further than Tahoe Tastings. This amazing tour company offers a sunset wine cruise that you’ll definitely want to take advantage of. 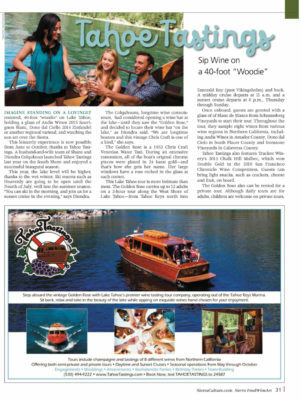 Tahoe Tastings is a wine tasting and boat tour company based in South Lake Tahoe, California. Thanks to this one-of-a-kind company, you can experience the beauty of Tahoe in a truly unique way. Wine tasting tours are always in style. Whether you prefer bold cabernet sauvignons or oaky chardonnays, or even luscious dessert wines like ice wines and vintage ports, there’s a wine tasting experience just for you. You don’t have to spend your vacation standing at tasting room bars. Get a little more adventurous. We’re talking wine tasting by helicopter, by kayak, or even on skis. Here are the wine tasting tours you had no idea you could book, but should pencil in now that you know. Set sail with Tahoe Tastings aboard the 40-foot Golden Rose, a classic wooden boat that was re-imagined as a Venetian Water Taxi. 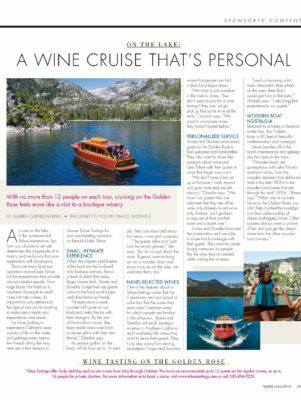 Twice-daily cruises chart a course from South Lake Tahoe to magical Emerald Bay—but only after guests sample a sparkling wine from Napa-based winery, Domaine Carneros. Over the next two hours, enjoy seven more wines, each hand-selected from boutique wineries across Northern California. Cruises sail with no more than 16 passengers, allowing for a more intimate experience in which to explore the character and complexity of each pour. A cruise on the lake is the quintessential Tahoe experience, but how you choose to set sail determines the magnitude of in­timacy and exclusivity that your experience will encompass. 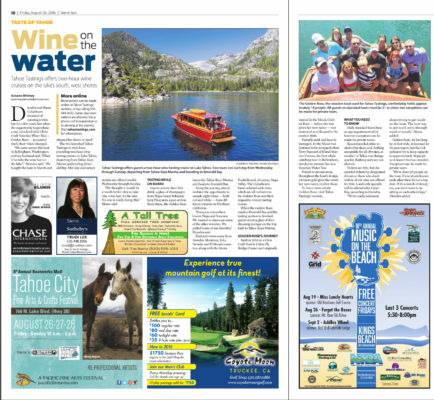 There are many boat tour operators around Lake Tahoe, but the experiences they provide are not created equally. From large boats that hold up to hundreds of people to small, more intimate cruises, it’s important to pay attention to the type of tour you’re booking to make sure it meets your expectations and needs. For those looking to experience California wine country while on the water, and perhaps even meet a few friends along the way, here are a few reasons to choose Tahoe Tastings for your next boating excursion on beautiful Lake Tahoe. Imagine standing on a lovingly restored, 40-foot “woodie” on Lake Tahoe, holding a glass of Andis Wines 2015 Sauvignon Blanc, Dono dal Ciello 2014 Zinfandel or another regional varietal, and watching the sun set over the Sierra. This leisurely experience is now possible from June to October, thanks to Tahoe Tastings. A husband-and-wife team of Shane and Diondra Colquhoun launched Tahoe Tastings last year on the South Shore and enjoyed a successful inaugural season. LAKE TAHOE, CA, March 30, 2017 /24-7PressRelease/ — Tahoe Tastings announces it will begin daily, Thursday – Sunday cruises June 1, 2017. Tahoe residents and visitors are invited to experience the beauty of Lake Tahoe aboard the Golden Rose, a beautifully restored 1953 Chris Craft Venetian Water Taxi, while tasting a curated selection of high-end boutique wines from across Napa Valley and Northern California. 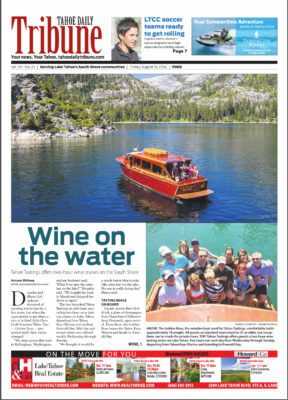 SOUTH LAKE TAHOE, Calif. — Diondra and Shane Colquhoun dreamed of opening a wine bar for a few years, but when the opportunity to purchase a one-of-a-kind 1953 Chris Craft Venetian Water Taxi — Golden Rose — presented itself, their vision changed.